1 Becoming As overcast and finally Ns with light rain between 1000-1900 giving 2 mm. Clearing skies after 2000. Top Tmax: Ghent 14,2°C, Zaventem had 11,2°C. 2 Partly cloudy with Cu Sc, during evening incoming Ci. Top Tmax: Kleine Brogel 20,9°C, Zaventem had 18,8°C. 3 Quite sunny with a few Cu in afternoon but later on also lots of Cirrus coming in from S. Top Tmax: Kleine Brogel 27,0°C, Zaventem had 24,8°C. 4 Quite sunny but from noon on becoming overcast Cs. Also tempo development of a few fair weather Cu. Top Tmax Kleine Brogel 27,2°C, Zaventem had 25,7°C. 5 Starting quite sunny, from noon on a stationary Cb cloud over SSE. Remaining dry with lots of Cirriform cloudiness. Top Tmax: Kleine Brogel 27,7°C, Zaventem had 23,6°C. From noon on, moderate to isolated severe thunderstorm did occur over provinces of Namur, Luxembourg, Liège, Limbourg and the east of Antwerp and Brabant. Local flooding was observed, Diest had with 22 mm the largest officially recorded amount of precipitation. 6 Quite sunny day, with from noon on some Cu, in afternoon tempo Cu con. Top Tmax: Kleine Brogel 25,2°C, Zaventem had 23,9°C. In the afternoon some weak to moderate thunderstorms did occur over provinces of Liège, Namur, Hainaut, and south of Brabant, Oost-Vlaanderen and West-Vlaanderen. Top precipitation: Koksijde 8 mm. 7 Tempo some light rain (with lots of dust) in morning, afterwards remaining cloudy to very cloudy with Ac. Top Tmax Kleine Brogel 25,1°C, Zaventem had 18,6°C. In province Hainaut, at the border of France, a few rumbles of thunder were heard during late evening. 8 Sunny start with Ci, from noon on increasing medium level clouds with light rain from 1500 on giving 1 mm by midnight. Top Tmax: 24,0°C, Zaventem had 20,7°C. 9 Light rain till 0200, giving another mm. Overcast with Stratus & misty till 1030, afterwards clearing skies. From 1630 on first Cb passed via north giving a few rumbles of thunder but no precipitation. Around 1830 a second weak thunderstorm passed with a few spots of rain. Between 2000-2230 another weak thunderstorm passed by, this time with light rain giving 3 mm. Full report to be found via this link. Top Tmax Kleine Brogel 25,9°C, Zaventem had 19,6°C. From 1400 on weak, moderate and isolated severe thunderstorms were observed over all provinces of Belgium. Locally flooding did occur (near Liège), and also some hailstones of around 1 cm were observed near Leuven. According radar pictures, a right moving supercell was observed in evening over province of Liège. 10 Fog between 0530-0800, remaining St overcast till 1030, clearing skies afterwards. After 1600 towering Cumulus with the passage of a weak thunderstorm around 1730-1800. This one developed to a severe thunderstorm a bit further westwards. Top Tmax Kleine Brogel 26,6°C, Zaventem had 21,4°C. Between 1300-2000 a couple of severe thunderstorms developed over Luxembourg, Liège, Namur and later also Antwerp en Oost-Vlaanderen. Hailstones of up to 3 cm were collected near Ghent. Also the other provinces had a couple of weak thunderstorms. 11 Sunny day with a few fair weather Cumulus. Top Tmax: Kleine Brogel 26,9°C, Zaventem had 24,0°C. 12 Quite sunny with during afternoon tempo some Cu clouds, some of them Cu con. Top Tmax Diest 26,1°C, Zaventem had 23,4°C. From the afternoon on till midnight some weak to moderate thunderstorms did develop over provinces of Hainaut, Namur, Luxembourg and Liège. Spa had the largest amount of rain with 17 mm. 13 Rain shower around 0600, cloudy with Cirrus and Altocumulus. Clearing skies after 1100 but well developing Cu clouds in afternoon with passage of a weak thunderstorm around 1815 and some hailstones of around 0,6 cm. From 1930 more rumbles of thunder were heard and this shower brought 3 mm in my collector. A bit further westwards, near Melsbroek - Steenokkerzeel, this thunderstorm produced within half an hour 24 mm with precipitation intensity up to 100 mm per hour and also hail was observed of around 1 cm. The same shower gave near Leuven more than 40 mm. Top Tmax: Kleine Brogel 23,5°C, Zaventem had 21,8°C. Today in afternoon thunderstorms developed over all provinces except West-Vlaanderen and Oost-Vlaanderen, but in the latter province there was some lightning over the extreme northeast. Most of them were weak to moderate, but at some locations in provinces Limbourg, Namur and Vlaams-Brabant they turned out to be rather severe with hailstones of up to 2 cm (near Hasselt) and flooding (Leuven). 14 Starting very St Sc cloudy and misty, during afternoon becoming cloudy with Cu Sc. Top Tmax: Deurne 18,5°C, Zaventem had 16,9°C. 15 Cloudy with Ci & Ac, later also Cu Sc with tempo a few drops around 1900. Top Tmax: Kleine Brogel 23,2°C, Zaventem had 21,6°C. 16 Cloudy with Cu, Sc, Ac & Ci. Towards sunset an incoming fading shower with some castellanus & mamma features but remaining dry. Just before midnight a light rain shower. Top Tmax: Kleine Brogel 22,1°C, Zaventem had 18,6°C. Today during afternoon and evening some weak to moderate thunderstorms developed over Hainaut, Namur, Luxembourg & Liège. 17 Around 0200 a moderate rain shower of 15 minutes giving 3 mm. Starting very cloudy with Sc, from noon on breaking clouds with Ci and Cu. Cs and As coming in after 1700 with light intermittent rain from 2000 on, intensifying towards midnight. Top Tmax: Kleine Brogel 21,9°C, Zaventem had 20,3°C. In the evening some weak thunderstorms did occur over provinces of Hainaut, Namur and Luxembourg. 18 Around 0130 a weak thunderstorm but with heavy rain producing 10 mm, afterwards for an hour or so lightning of a new multi-cell over the south. During the day cloudy with Cu Sc, after 1700 further decreasing cloudiness. Shower in distance just after sunset. Top Tmax: Kleine Brogel 20,6°C, Zaventem had 19,0°C. In the night weak to moderate thunderstorms were observed over all provinces, an isolated one turned out to be severe (near Namur). After sunset more weak to moderate thunderstorm developed over West- & Oost-Vlaanderen and Antwerp. 19 Light rain between 0430-1100 giving 3 mm. Breaking clouds from 1400 on, the blustery winds with gusts of around 40KT remained till sunset. Invading Cirrus from 1800 on. Top Tmax: Charleroi 17,1°C, Zaventem had 15,9°C. Last night, between 0030-0300, more weak to moderate thunderstorms developed over provinces of Hainaut, Namur, Liège, Limbourg and east edge of Brabant. 20 Light rain between 0400-0900. Breaking cloudiness but becoming rapidly cumuliform. A first weak thunderstorm passed the area around 1030 with a magnificent whale's mouth feature, followed by blustery rain and some small hail. After a brief sunny spell, another weak thunderstorm, this time with heavy rain and a wind gusts of up to 51KT, passed the area around 1415. Temperature descended to a shivering 7°C. Afterwards more light rain showers passed, between 1930-2100 tempo some light continues rain. Total amount in collector 12mm. Check also full pictorial report. Top Tmax: Kleine Brogel 16,9°C, Zaventem had 15,5°C. Today two major trough lines passed a large part of Belgium. Lightning activity was low, but there were some damaging turbulent winds. Among the locations who were hit are Moorsele (possible a weak tornado or gustnado), Sint-Pieters-Woluwe, Leuven, Hasselt and Mons. 21 Cloudy to very cloudy with Cu Sc Ac. From 2000 some light rain showers, around 2100 passage of a weak thunderstorm but with some close impacts. After a brief pause another weak thunderstorm passed by around 2300. Total amount of rain was 6 mm. Top Tmax: Charleroi 18,9°C, Zaventem had 17,7°C. During the evening some weak to moderate thunderstorms passed over Belgium, except for provinces of Oost-Vlaanderen and Luxembourg. An isolated one was even severe, namely near Namur and northwestern coastal area. 22 Light rain between 0430-0630. Very Sc cloudy till 1000, afterwards partly cloudy to cloudy with Cu Sc. Around 1900 passage of a light rain shower, intermittent light rain from 2200 on. Top Tmax: Kleine Brogel 20,4°C, Zaventem had 18,9°C. During first part of the night a few weak thunderstorms over Namur, Liège, Antwerp, Limbourg and SE part of Brabant, in the morning again Namur, Liège and Limbourg. In afternoon a couple of weak thunderstorms over Oost-Vlaanderen and Luxemboug, in evening a few rumbles over province Limbourg. 23 Light intermittent rain between 0100-0300 and 0700-1030. Afterwards building cumuliform cloudiness with passage of a weak thunderstorm around 1400. Light rain shower around 1900, afterwards clearing skies with Cirrus in the west. Top Tmax: Kleine Brogel 14,7°C, Zaventem had 13,1°C. Today in afternoon development of few weak thunderstorms over all provinces except for West-Vlaanderen and Luxembourg. 24 Forenoon partly Cu cloudy, from noon on a couple of light rain showers with gusts up to 30KT. 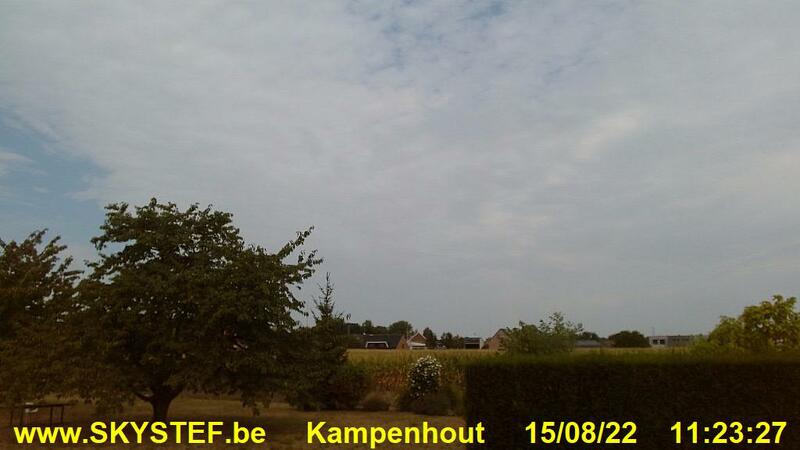 Top Tmax: Kleine Brogel 15,9°C, Zaventem had 14,3°C. 25 Light/moderate rain between 0100-0700, than light drizzle till 1400: 12 mm in the collector. Remaining very Sc cloudy, few gaps after 1600 and almost clearing skies towards sunset. Top Tmax: Kleine Brogel 16,9°C, Zaventem had 15,7°C. 26 Becoming overcast in morning with rain & drizzle between 0800-2000 giving 17 mm. Top Tmax: Bièrset 16,1°C, Zaventem had 15,6°C. Top rainfall till 2000: Elsenborn 30 mm followed by Spa 29 mm. 27 Overcast St, Sc with intermittent slight drizzle, more light rain between 1800-2400 giving 11 mm. Top Tmax: Bièrset 17,0, Zaventem had 15,1°C. 28 Partly cloudy with Cu, dissipating towards sunset but invading Cs. Top Tmax: Kleine Brogel 19,2°C, Zaventem had 17,1°C. 29 Light rain between 0630-0900 accompanied by two hard rumbles of thunder around 0715 & 0815. The day remained quite unstable with Cb & TCu clouds and a couple of rain showers, going on till midnight giving around 7 mm. Top Tmax: Kleine Brogel 17,6°C, Zaventem had 14,2°C. Today all provinces had a couple of weak thunderstorms, in morning only over the center and east. During the afternoon a waterspout was observed near Nieuwpoort. 30 All period long remaining unstable with Cu, TCu a Cb cloudiness. More than a dozen light rain showers passed by, some of them with small hail, giving a total of around 3 mm. Top Tmax: Kleine Brogel 14,9°C, Zaventem barely 12,3°C. Today, in the morning hours, even some wet snow over Elsenborn. Very low temperatures for the season: top Tmax included Spa 7,2°C, Elsenborn 7,7°C, Florennes 10,2°C, Koksijde 11,1°C, Chievres, Semmerzake & Ostend 11,4°C, Deurne 11,5°C, Liège 11,6°C, Charleroi 11,7°C. Also today in afternoon a couple of weak thunderstorms over provinces of Liège & West-Vlaanderen. 31 Mostly very cloudy with Cu Sc and between 0600-1700 half a dozen of light rain showers giving 2 mm. Afterwards remaining Sc overcast. Top Tmax: Kleine Brogel 15,3°C, Zaventem had 12,3°C. Again very low temperatures: Spa 8,7°C, Elsenborn 8,8°C, Florennes 10,4°C, Charleroi 11,3°C, Ghent 11,5°C, Brasschaat 11,8°C, Semmerzake & Deurne 11,9°C. This morning one station with negative grass minimum: Chievres -1°C.